Unlocking the Poetry of W.B. Yeats undertakes a thorough re-reading of Yeats' oeuvre as an extended meditation on the image and theme of the heart as it is evident within the poetry. It places the heart at the centre of a complex web of Yeatsian preoccupations and associations—from the biographical, to the poetic and philosophical, to the mythological and mystical. 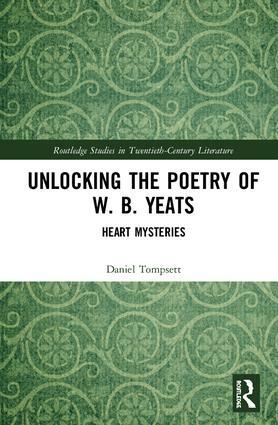 In particular, the book seeks to unlock Yeats’ mystifying aesthetic vision via his understanding of the ancient Egyptian "Weighing of the Heart" ceremony. The work provides a chronological narrative arc that looks to use the theme of the heart as it recurs in the poetry in order to circumvent and overcome more established frameworks. Its purpose is to offer refreshing ways of conceptualizing and building alternatives to more deeply entrenched, but not entirely satisfactory arguments that have been offered since Yeats' death in 1939, while demonstrating the centrality of the occult to Yeats' art. Daniel Tompsett was awarded his PhD in English Literature by Queen Mary, University of London. In 2012, he published Wallace Stevens and Pre-Socratic Philosophy (Routledge), and is principally concerned with 20th Century poetry, Modernism, and the connections between philosophy, mythology and literature. He is currently Head of Research at a UK Accountancy and Advisory firm.